It's no small thing to be invited to Mike Portnoy's inaugural Progressive Nation at Sea Festival, but Brazil's Daydream XI made the cut. While not on the headline stage, the band was invited to join 16 other bands on the newly created New Millennium stage for up and coming acts. And all this occurred before the release of the first full-length album, The Grand Disguise, which is before us today. Daydream XI: another band a victim of Photoshop. Considering the breadth and depth of Portnoy's skills and experiences, one wonders what he found intriguing about the band. 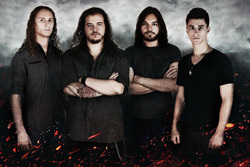 Obvious comparisons can be made to their influences like Brazil natives Angra, but also the gamut of progressive power metal from Dream Theater to Symphony X. Considering the general heavier character DXI probably leans more to the latter and falls in the general category of contemporary European power prog. Maybe he just liked the 23 minute opus that is the title cut. While it has its speedier moments this one song leans more toward traditional progressive metal. But, generally, most every song is characterized by the heaviness and briskness of power prog metal. Early on Keeping the Dream Alive, Watch Me Rise, and Guts of Hell rush and rumble along assertive speed born by flailing drums and sharpened by razor riffs. After these things the other immense element is the equally brisk and soaring guitar solos; The Grand Disguise is definitely an album for those who love lead guitar. At this point it's enough to say, "just push repeat" for the rest of the album. There may be some exceptions. Upon first listen The Age of Sadness seemed to back down on the heaviness and razor riffs for something with a more accessible rock groove, but I was mistaken. Though there is something catchy about the refrain. But, Alone definitely breaks the mold of the album, offering some more gentle and light, moving mostly by vocals and the combination of acoustic and electric guitars. It precedes the final, aforementioned, title track, and easily became my two favorite ones here, followed by Keeping the Dream Alive, Like Darkness Rules the Night, and Wings of Destruction. Ultimately, Daydream XI hits what they're aiming for, The Grand Disguise is straight forward, interesting and entertaining, melodic progressive power metal in the best tradition. We can only expect more and better from this talented band. 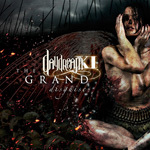 Ultimately, Daydream XI hits what they're aiming for, The Grand Disguise is straight forward, interesting and entertaining, melodic progressive power metal in the best tradition. We can only expect more and better from this talented band.